Can you please offer help for the PRTG welcome wizard Essential Settings screen? What is the administrator email address for? 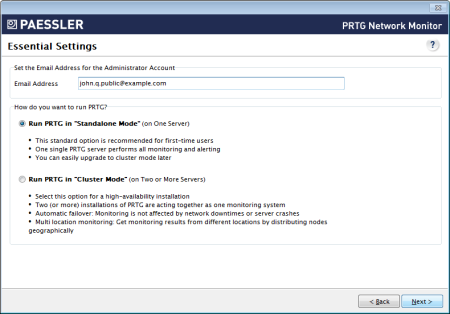 PRTG will automatically pre-configure as many settings as possible for your convenience. However, there are some essential data you need to enter at this point. How do you want to run PRTG? For a general introduction into PRTG's clustering feature and more background information, please see question What's the Clustering Feature in PRTG?